Quite a few months back the lovely Lucy, behind the Edinburgh Food Tours, invited me to come along on a tour and the time finally came last weekend. This food tour takes you around some of the highlights of Leith, which us foodies know is really turning into a hot-spot whether you're looking for breakfast, brunch, lunch or dinner. Leith is probably my go-to for weekend brunch these days with new cafes and restaurants opening all the time. I was pretty excited for the tour to see if I could discover any new places to try. Our meeting point was on Custom lane just off Commercial street, right next to our first stop of the tour Williams & Johnson Coffee Co. Williams & Johnsons are a micro-roastery based in Leith and their flagship cafe is tucked away just over the bridge on Custom lane. You can tell the minute you step in that this is a company that is passionate about their product. The back end of the cafe is lined with bags of their coffee beans alongside the biggest coffee machine I've ever seen, aptly described as a 'sinister looking Thomas the Tank Engine character'. Coffee lovers will find this place a dream - and while we all know I'm not a coffee drinker, I decided this was my opportunity to try it out. The Williams & Johnson coffee is rich and aromatic and I think coffee lovers would love it. They also have a chocolate tree - you heard right! So the morning began with, of course, coffee and a cake. Because what decent Saturday morning doesn't start with chocolate? As soon as we arrived we were treated to a ginger and chocolate brownie courtesy of Glutteny, who's gluten free cakes are available at Williams & Johnson. While for some a brownie may be too rich of a cake to enjoy with a coffee first thing in the morning, you were totally welcome to wrap it up and save it for later. I, being insanely gluttonous, ate the whole thing... sorry not sorry. Once our coffees arrived, the staff at Williams & Johnson told us a little more about the company's background and what they do today. After cake and coffee it was time to head off to our next destination, the Leith Market. We were introduced to the people who run the market (the same people who run the Stockbridge, Grassmarket, Fountainbridge & Potterow markets) and then we were off to sample goodies from around the stalls. Every stall we went to we got to chat with the owners, find out about why they got into the food business, how they make their products and what makes their products so special. It started with smoked mussels (oh my god, I was so apprehensive but oh my god, were they so good) and smoked duck from Caithness Smokehouse. Then it was on to hearing about how good pickles and ferments are for your gut at Aye Pickled (and tasted pickled avocado). We tried out some local brews from Wasted Degrees Brewery. We tasted delicious handmade gourmet pies from Pie Dolly (the ham hock was my favourite). And finished it all off with a sweet treat; a delicious banoffee donut from the Kilted Donuts! 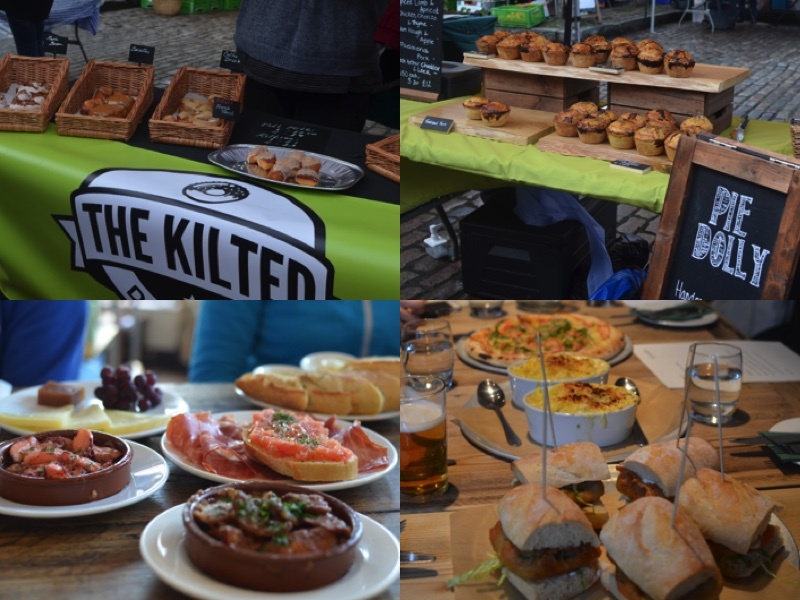 The Leith Market is ideal for food-lovers with so many stalls selling delicious, Scottish food. They even run an entirely vegan market on the first Saturday of every month. Speaking of vegan, the next stop along the route was Harmonium. Harmonium has been on my radar for quite some time as my veggie friend harps on about it all the time. While I'm not vegan, I make a conscious effort to not eat too much meat every week. I tend to eat pescatarian Monday-Friday and have meat as a weekend treat. I never think I could eat fully vegan because I cannot cut out cheese, it is my greatest addiction. So how did I fair with an all vegan meal? Actually pretty well well. At Harmonium, we had a sort of banquet of vegan food and it was definitely the kind of vegan that appeals to non-vegans. The chef came out and spoke to us after the meal and told us that she wanted Harmonium to serve accessible vegan food, so if you were vegan and taking your non-vegan friends or family for a meal they'd be excited about their food too. And I really think she has accomplished this. I can truly say I did not miss meat in the meal... I didn't even miss the cheese! Yes, I know shock horror! Our meal consisted of 'Seared King Oyster Mushroom Scallops', 'Macaroni Cheese', 'Beer Battered To-Fish Bites', 'Italian Sausage Pizza' and 'Chocolate Cheesecake Bites'. I want to tell you what was my favourite, but honestly I couldn't pick! The 'to-fish' bites shocked me the most. I've always thought faking fish was well... frankly... kind of gross? But these were amazing. I wasn't at all freaked out that it tasted like fish and wasn't fish, especially when I realised what gave it that fish-shop taste. Vinegar in the batter and nori in with the tofu. The macaroni cheese was exactly how I like it, full of flavour, crunchy on the top and creamy on the inside. It did not taste like fake cheese at all to me and I was, quite frankly, shook. By the time I tucked into the pizza, I had, hand on heart, completely forgotten that this was a vegan meal. In my head I was thinking 'oh this vegetarian sausage is decent' not even remembering that THE CHEESE WAS VEGAN! So congratulations Harmonium, you fooled the cheese princess (me, duh). I am already super excited to pay Harmonium another visit and you'll definitely see a full review on here soon! After all that food you think we'd be done right? Wrong. This is a food tour designed for people like me, who love to eat. Of course we didn't finish absolutely everything on our plates, but the kind staff at Harmonium wrapped it all up for us to take away. With our takeaway vegan (who'd have ever thought those words would come out of my mouth) it was on to the final stop. What could be next? Tapas and wine, of course. The last stop of our Leith tour was Serrano & Manchego on Leith Walk. I was so excited, this was one of the first places I reviewed on my blog and I hadn't been back in so long. A glass of wine was much needed after all the eating and Serrano & Manchego has a great selection. If you've never been, the restaurant feels really authentically Spanish. If you didn't look out the windows you might even think you were in a tapas bar in Barcelona! They serve up delicious, rich little dishes that we somehow managed to fit in. We had the classic 'Chorizo al Vino', Serrano ham served with 'pan tumaca', grilled octopus, manchego cheese and some bread with balsamic oil and aioli. While I was feeling pretty full by this point, a little wine and nibbles were still well received. Overall, I really enjoyed the tour. Probably my favourite aspect of the tour, aside from the food of course, was getting to meet the people behind the brands and finding out how and why they got started. As a massively passionate foodie myself, their stories made more excited to taste their creations. I'm often worried that when I go to launches, events or experiences like this that you won't get a lot for your money, but at the Edinburgh Food Tour that could not be further from the truth. We got way more food than we could even eat (and that's saying something for me) - and we got to take some away! It's a great way to spend a weekend morning, whether you're new to town, born and raised in Edinburgh or a tourist. If you're new to Edinburgh or visiting for a short time, it's a great way to find out about some of our fantastic local restaurants, cafes and markets all in a short period of time. But even if you're an Edinburgher the tour will give you a renewed sense of gratefulness for the city we live in. There are so many fantastic local producers and places to eat here who are completely passionate about food. This is a great way to learn more about them - and try them out! The Edinburgh Food Tour is £50* per person and takes place most Saturday mornings. Check out their website for full details and to buy tickets. *Disclaimer: I was offered a place on the tour for a discounted price. But my review was written entirely with my own thoughts and opinions, and on my own accord.